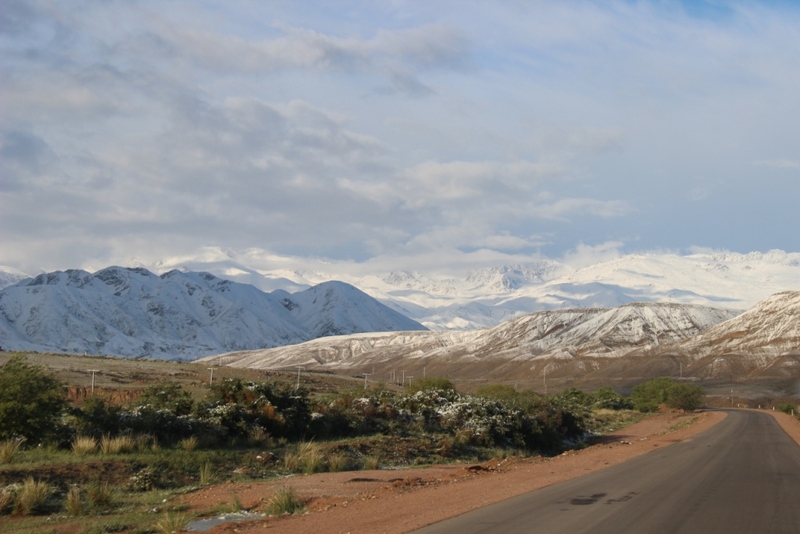 They say first impressions count – and Kyrgyzstan had certainly delivered. We awoke just by the border, officially about 10 meters into the country, immediately the roads were near perfect, and within a few kilometers we were surrounded by beautiful mountains, a standard of which we had not seen since Turkey – it made a nice change from the barren desert we had become used to. 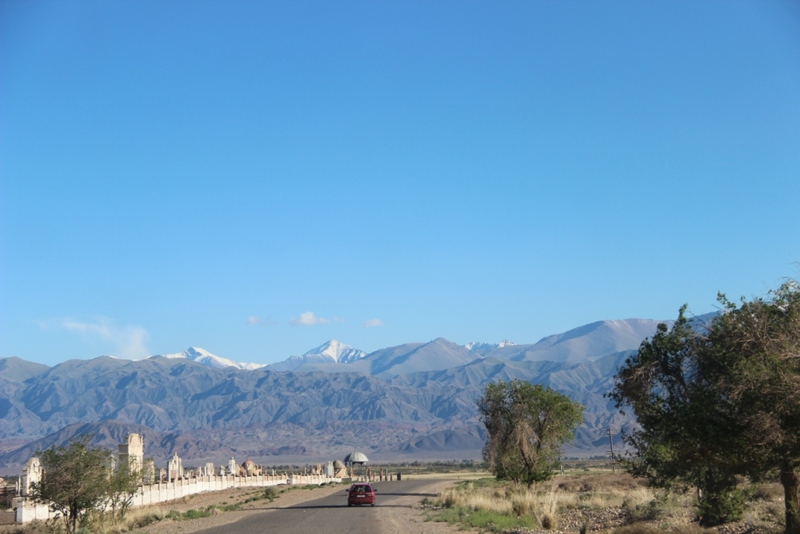 Although we had passed through one range in Uzbekistan, it was nowhere near as impressive as the Tien Shan Mountains that greeted us now. 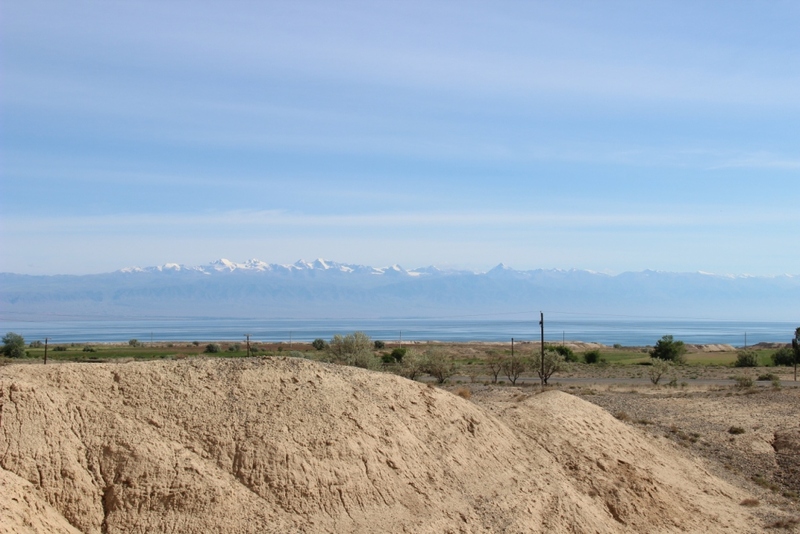 After stopping for a breakfast of local fruit that we had picked up from an Uzbek roadside trader the day before, and with a grand view of a reservoir, we continued north towards the capital city of Bishkek, where we planned to spend a few days readying Ivor for the grand China crossing. We veered off the road to take a break by a turquoise lake nestled in one of the valleys for a bit of a swim. Having 11 days now to make it to the Chinese border and at least being in the right country, we felt we could take a little more time over our journeys rather than just having to eat up kilometers as fast as possible – this approach meant that we could really make the most of the Kyrgyz landscape. As we climbed another mountain pass, we pulled off the road and down a track that lead us to a wild river, still bulging with spring melt and set up to camp for the night. Today we would be treated to a pair of mountain passes above 3200 meters and a route that took us straight across a massive plateau where we could see many of the yurts typical of the region, as well as the nomadic peoples that still live as herdsmen up in the unforgiving terrain. 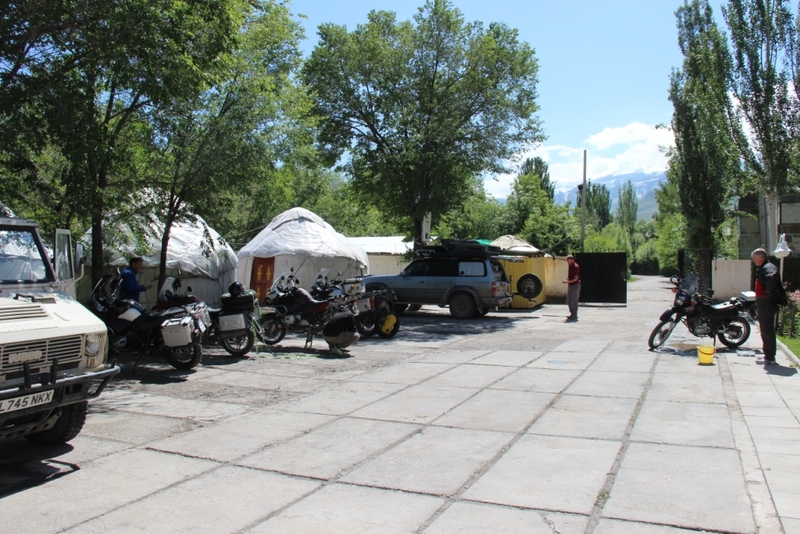 We descended into Bishkek, and after stopping in to pick up some local currency from an ATM (such a luxury after Uzbekistan) we headed back out from town again to find somewhere to camp. The sprawl from the capital city was far reaching, so it was a long time before we found a site near a lake to settle for the night. 1) Change the leisure batteries; it was now possible to watch the charge free fall in a matter of minutes. 7) Find some plastic crates to replace the cardboard boxes that were full with various spares and tools in the ‘garage’ at the back of the cabin, these had been steadily disintegrating with every search at the border crossings. The task for today would be the fuel tanks – finding an electric pump to go from one tank to the other should do the trick. Having neither a grasp of the Kyrgyz or Russian languages though, this could would still be a challenge. Google translate provided a basic Russian phase to explain our predicament, which we could transcribe and show to unsuspecting stall holders until we got what we were looking for. A tour of several large bazaars followed with specialties varying from agricultural equipment to household goods, but still no electric fuel pump section. Finally, after losing most of the day to the search we were steered to a proper auto shop where they managed to help us. All we had to do now was find some electrical components and some fuel line bits from an auto bazaar and we were good to go. After the previous ‘stans’, where you had to haggle over the exchange rate to get the cash in the first place, and then negotiate hard for everything from fruit to diesel, it was a relief to get the price for everything straight up – and even the price already clearly displayed next to some products – imagine that! Once the parts were purchased the actual fix only took an hour or so, and was finished just before sundown. We rewarded ourselves by parking up for the night next to a restaurant so we could have a meal and a few beers – it was here that we first spotted the strange trend that Kim’s beer would always be served with a bendy straw. After the success of the day before, we set out with the aim of finding some small ratchet straps that we could rivet to the cab roof for fixing the sand ladders and chairs out of the way. 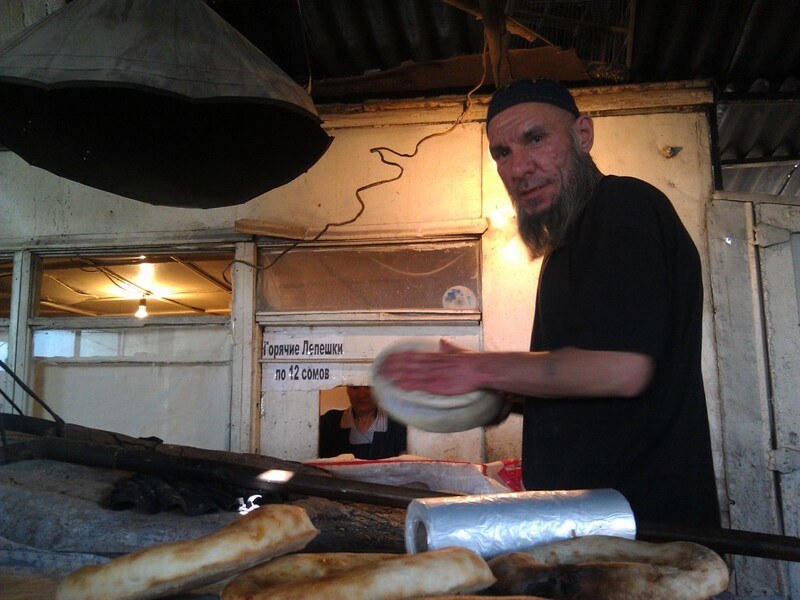 We bought bread from this guy, the traditional Central Asian bread is kneaded flat, and then slapped against the wall of a clay oven to bake it. To cut a long story short, after a solid day of searching the wild geese remained free to go about their business. Even after traipsing through many bazaars, some as big as a small town, we were forced to give up and headed back to the camping spot by the lake for the evening. The day started with a bit of spanner work on the truck – the howling brakes were again temporarily abated with a sand down, and the fluid levels in the gearboxes, differentials, and transfer box checked – phew, all was good. The short list for the afternoon was to find batteries, some towels (to stop the gritty sand ladders from chewing through our roof or each other in storage), get the water tank bracket welded, and pick up some massive straps that we’d seen the day before, designed for holding down the curtain sides of lorries, overkill or sure, but they would definitely do the job. We succeeded at the whole list and again rewarded ourselves with a restaurant meal and a beer or two – complete with bendy straws for Kim. Our Bishkek list was getting smaller, it just needed one big push and we would be China-ready. We set to work and changed batteries (and responsibly disposed of the old ones with a friendly garage who were prepared to waiver the normal fee since we were both foreign and confused), had an oil change, and borrowed a drill from the garage so that we could rivet on our now roof top tie downs. And this was all before lunch. Early in the afternoon we made one last trip to a bazaar and were furnished with metal paint for the newly welded tank bracket, and some large plastic crates to sort out the crumbling pile of cardboard and spare parts in the storage area. Throughout the trip, for one reason or another quotes from the movie “The Big Lebowski” have resonated with us; this time it was “strikes and gutters man”. Today would be going down as a strike. To cap it all off we parked up at a hostel to meet one of our China crossing buddies, Jon, for the first time to go out for yet another meal out and to sample some of the Bishkek nightlife. 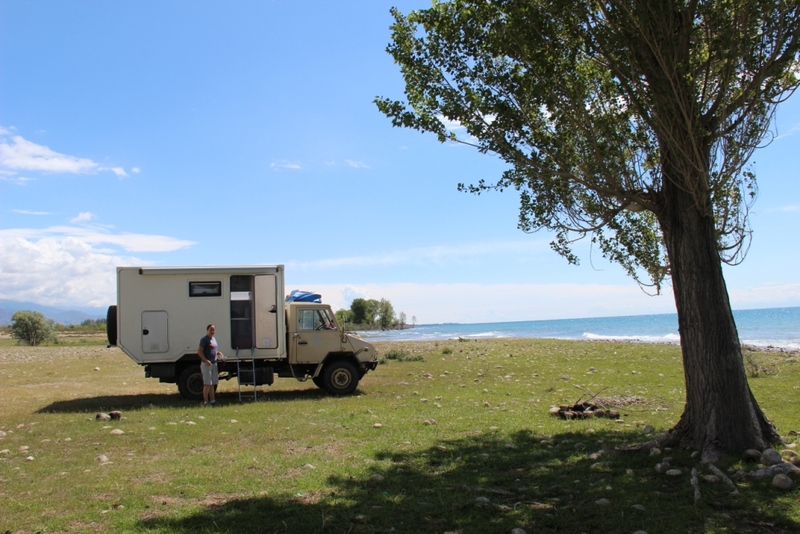 We also met with another couple from the UK – Gareth and Lisa who had been overlanding with their land rover for several months. Their adventurous route had already taken them via the arctic circle and the Pamir highway. We assembled a ramshackle bunch from the hostel, and headed out on the town – the first we’d really seen of Bishkek that wasn’t based around the search for car bits. For the last month or so the locally available food had basically consisted of grilled meat on skewers, with rice and perhaps a tomato / cucumber salad, so we were keen to hear from the Norwegian traveler at the hostel that there was a good Chinese restaurant in town – we blissfully overlooked the fact that we would be in China in 6 days time and elected to go there anyway. Moving onto a local bar, we came across some Americans, both connected in some way with the local air base, who were keen to be able to speak English to some fresh faces. They asked what we were drinking, so we asked for a beer. We assume they didn’t hear, since very shortly afterwards a row of shot glasses brimming with vodka appeared on the bar. Oh dear, it was going to be one of those nights. The early bird catches the worm; the late bird catches a bit of a hangover. We’d originally planned to fill up our water tanks, send a few emails and set out from town nice and early towards Lake Issy-kul. Early morning slid to late morning, and that in turn slid to early afternoon – but we did eventually get on the road. We stopped briefly on route to line a bent policemens pockets because we did not have our headlights on, as you are supposed to all day. You can normally tell when a traffic cop is abusing their position, because they are prepared to haggle over the cost of the fine – in this case Vaughan managed to get the cost of the offence down from 100 USD to 500 Kyrgyz Som (approx 10 USD) – definitely suspicious. Failed for a long time to catch this critter on camera. We were lacking ornithologists, so the best guesses we could find were ‘Rock Crow’ from a suspect Uzbek translation, or ‘Blue Bird’ from anyone else. 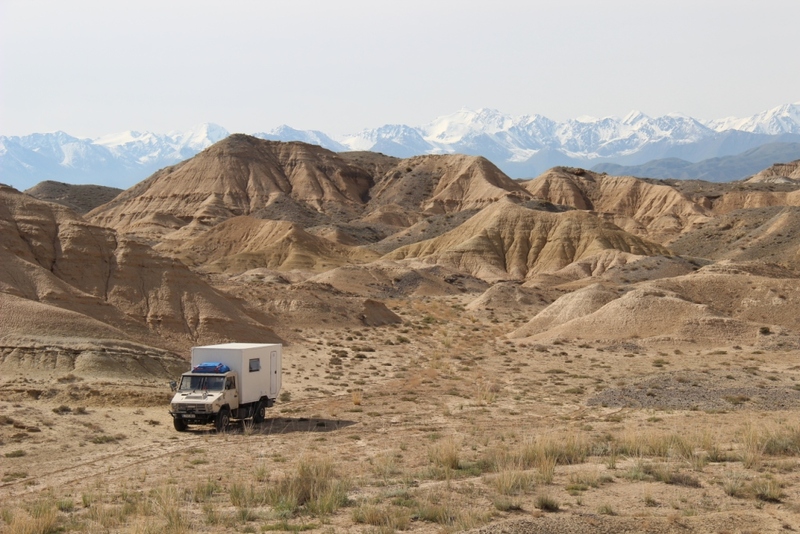 The troublesome truck paid us back though, easily cruising away from the road to find what might well have been the best camp spot of the trip so far – surrounded by dunes, with the snow capped Tien Shan mountains as the backdrop, and with the grand lake Issy-kul only a few hundred meters way. We had managed to keep a couple of days of margin hidden away before our China crossing, and hoped to cash them in here around the lake. We would try to squeeze in a bit of mountain biking or hiking for some well overdue exercise, and as a good excuse to escape into the surrounding mountains. But first we would have to find a map. Another lesson learned, if you are in a big city and know you will need a thing, whatever it is, get it straight away. As it was we followed the best part of 100 kilometers worth of spurious directions to various shops and tourist information centres before giving up on the whole map idea and downloading some routes from a website instead. We made a moderate effort at starting a route listed on the website as ‘trail running’. The initial climb was brutal, and the going was tough so we decided to cut the route short and turn back to tackle it fresh the next day. The local restaurant that we stopped in at clearly had a high enough turnover of tourists that they didn’t have to worry about whether their customers returned or not – after some burnt dry chicken, lightly fried (mainly raw) potato, and a carton of fruit juice we escaped the town and picked our way through some dirt tracks to the lake shoreline to camp for the night. A much more valiant attempt at piloting mountain bikes around the trail running route. The trail was good and technical for the most part, but as we approached the point furthest away from our start it rapidly degraded to goat track, and then down to nothing at all – so we were just riding through the undergrowth using the GPS so that we could stick to one bearing. Continuing on our way around the loop the trail showed little sign of improving, or indeed existing for another couple of kilometers. After a few scraped shins from spiky gorse bushes, and a few scrambles through some steep sided valleys we descended a rock strewn gulley and at last found some firm dirt beneath our tyres again – and we were rewarded for all the effort that we had put in gaining altitude earlier in the ride with a 4 km descent that weaved its’ way down the valley floor – hopping through rock gardens at a pace that was veering towards irresponsible, but it was just too much fun to haul on the brakes (that’s Vaughan’s take on it, Kim was definitely using her brakes!). It was not long before we were back at the truck – considering that we had set off into the mountains both mapless and clueless, and with only a GPS route intended for a different type of sport we’d come out almost totally unscathed, and had managed to get a fair dose of good riding into the bargain. Not bad for a mornings work, not bad at all. The weather had taken a turn for the chilly so we figured that we had enough time to boot it through the mountains to get to Naryn that evening rather than camp by the lake for one more night. This would be the last major town before the Chinese border, and was the location chosen to meet the rest of the China crossing party. As we reached the western edge of the lake the weather worsened and the showers that had been occasionally irritating us on the ride had turned to downpours with very strong winds, and as we travelled yet further we noticed a snowline on the surrounding mountains that had not even been there the day before. Seriously Kyrgyzstan, this on not how summer is supposed to work – its JUNE for fecks sake. The rain turned to blizzards, and ongoing upgrades to the mountain road meant that tarmac turned to potholed gravel. Trees were being pulled down all over the place by the unseasonal downfall weighing down their branches, and the slushy snow was covering the road making it impossible to avoid taking a beating from the uneven surface beneath it. Our pace dropped right down as the light began to fade so it was looking like we would have to turn back that evening, and have another attempt the next day. To make matters worse the coolant problem that we had suffered from a couple of days previously had meant that there was an airlock in the heater circuit, so there was nothing to prevent the drafty cab from falling to the same sub-zero temperatures of outside. 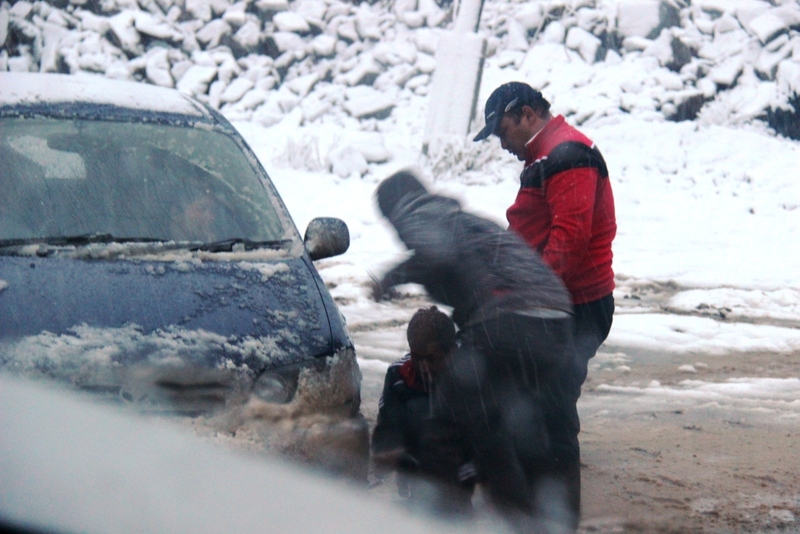 We stopped to help a local change a wheel after they had gotten a flat from hitting something in the slush. The son spoke good English and managed to explain that they had just come from Naryn, and that the road went much higher into the mountains and the snow was worse where they had come from. We also learned from the boy that we were being treated – since they had never known it to snow at all in June, let alone this heavily – lucky old us. Still, the decision had been made, we drove back to a nearby town and camped in a side street and the snow was still falling around us – we would have another go the following morning. At first light were on the road again to get through the mountains before any more snow could come and spoil our party – pausing only briefly to reverse Ivor into a ditch, and then drag him out of it. The downpour had stopped overnight and although progress on the torn up road was slow, it was at least steady. As we neared the summit of the mountain pass it was clear that we had done the right thing in giving up the night before – the whole road was white, and both sides of the summit were steep. To add to it a snake of wheel spinning trucks were slowly digging themselves holes in the snow until they finally gave up and fitted chains, making yet another obstacle to weave around. Much better to be taking this on in the daylight for sure. 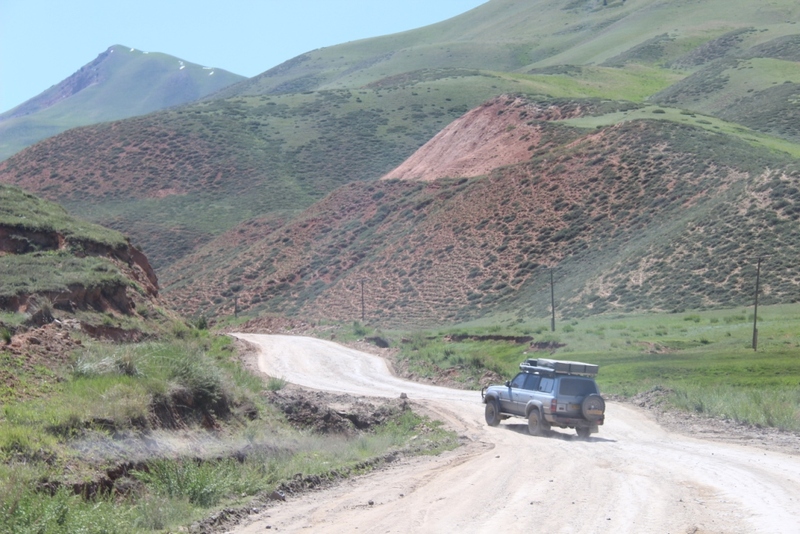 Engaging four wheel drive got us up the pass without a problem in the end, and we descended into Naryn without a problem – stopping only to chat to some cycle tourists, and to warn them about the ascent that awaited them. For the most part the roads in Kyryzstan were pretty good, we were just unfortunate to get the very worst of them at the same time as a dump of snow. We found the hostel here the others were staying in town, and were introduced to Artur, David, and Jimmy G. Little Jimmy, Jens, and Jon were to arrive later that day, and Clive the following day. An agreeable bunch, all clearly excited about the trip through China that was now only a couple of days away. After spending a little time bleeding that damn cab heater we dined on shashlik (of course), and raised a glass or two with our new amigos for the next stage of our adventure. The biking had taught us both that were in need of some exercise to get back in good form after all this time working on the truck and then sat on our butts in the cab – Vaughan tried to set about putting things right by taking an early morning jog up a nearby hill, the heavy wheezing and panting that followed were to show just how much it was needed. 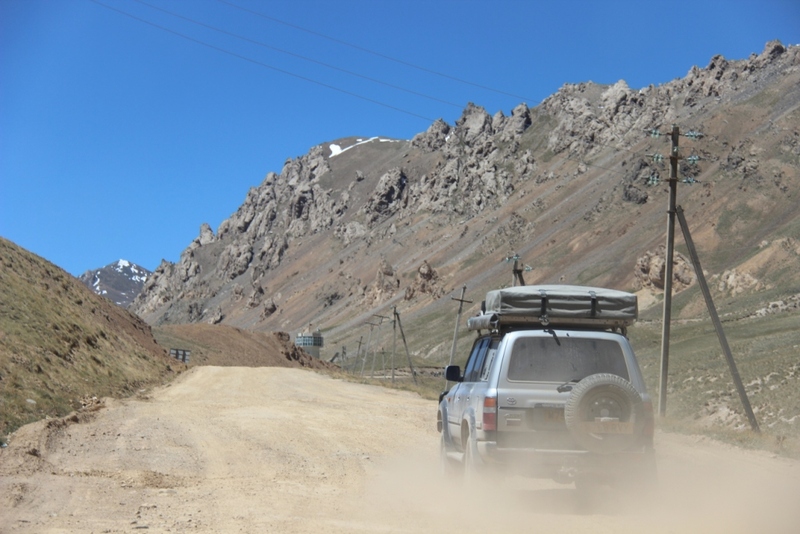 After picking up some supplies from the local bazaar we set off with Jon, the other 4×4 driver of the group, from Naryn towards an ancient caravanserai where we could camp for the night – so that we would only have 100km or so to cover before the border crossing the next day. 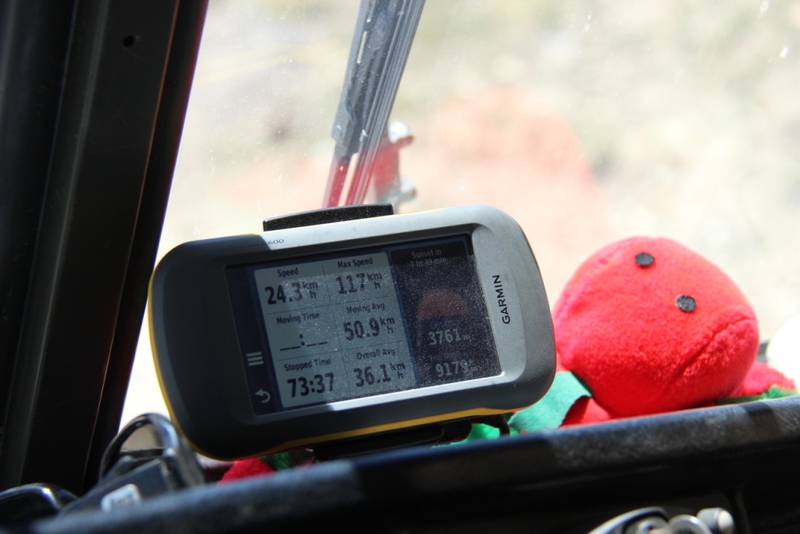 The bikers decided to stay in Naryn and to do the whole distance to the border the next day. Arriving with plenty of light left in the day we settled down to a fine barbeque and a few beers before going to bed safe in the knowledge that the goal that we had set the best part of a year earlier was definitely within our reach – barring any unjust calamities, we would be crossing that border. Just 100km and one mountain pass separated us and China. As we rallied down the track from the caravanserai towards the main road Ivor was to play one more trick – the brake warning light flickered and came on. A quick check showed that the fluid level was still where it should be, and all the brake parts seemed to be where they should be. Not the kind of examination that is ideal with the first signs of a brake problem on the day you take on a 3700m mountain pass, but hey that was all we had time for, it would have to go on the to-do list. Back on the main ‘road’ the perfect tarmac quickly faded to dust; Kyrgyzstan had been saving her worst roads for the border. A good job we had eaten up some of the distance the day before. In some sections the track was so torn up that it was both quicker and smoother to drive out across the open grassland on either side, dodging the occasional boulders and gullies that crossed it, than it was to stick to the main route. Hard to believe this is the main road to the border. Thankfully the Chinese have taken it upon themselves to give it a long overdue upgrade. After a painful 3 hours on the trail we made it to the remote border post, gathered the appropriate passport stamps, haggled over fees, and caught up with the bikers in time to meet up with our guide for the China leg. A years’ worth of work to get to this one definite deadline in our schedule – it was a relief to be there at last. What fun to read your great travelogue! I found it totally engrossing. I can see I needn’t have been worried about your abilities to handle mechanical and electrical issues: You are two very intrepid tourists. Keep the blog coming! Amazing scenery and another beautiful tale… looks like this trip is 200% freedom, thanks for sharing this adventure with us!